Izmir, located on the eastern banks of the beautiful, deep blue waters of the Bay of Izmir, is Turkey’s third largest city. It is also Turkey’s second largest port and a very popular holiday destination – though perhaps less well-known than rival destinations such as Istanbul or Antalya. The city itself has a reputation for being laid-back and liberal. Combining this fact with the excellent weather, amazing food, friendly locals and a veritable wealth of attractions makes it one of the hidden jewels of the Mediterranean. Need more convincing? Well, if that is still the case, here are 7 reasons why you should visit Izmir for your upcoming holiday. History buffs will have a field day here. After all, the city is over 3,500 years old – so we are talking about some serious history to explore! With a city that boasts such a rich history, it’s actually quite hard to pinpoint just a few stand-out examples. One such sigh, however, is the Izmir Agora. This is to a certain extent the local equivalent to the Palatine Hills above Rome. 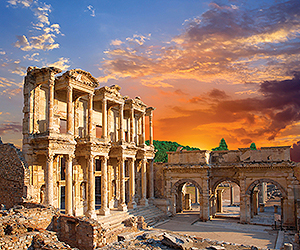 Located in the very centre of the city, these remarkably preserved ruins of a 2,000-year-old marketplace allow you to walk in the footsteps of Izmir residents of old. While this is just one historical sight in this ancient city – if you’re going to make a beeline for one, its premier location and amazing sense of history make this a winner. No visit to any town in Turkey is complete without a trip to the Bazaar, and Izmir is no different. Kemaralti is the central bazaar, and very much recognized as the premier market space in the city. What you may find strange about this market is how friendly the market traders are. Yes, they are still looking to sell you their wares and yes, they are willing to engage in the ancient and noble art of haggling should you wish. But, they are also more than happy to simply stand about and chat with you, even when they know you’re not looking to buy. That adds a really friendly, laid-back atmosphere to the place, quite in contrast to some other Bazaars that can frankly come across as quite frantic – often even aggressive. Here you can simply wander around and enjoy the sights, the sounds and smells of one of the friendliest markets you’ll ever experience. The mark of a great holiday destination is that there is enough in the surrounding area to support an excursion or two. In Izmir, this comes in the form of the surrounding hills that are home to a number of wonderful little villages. The pick of the crop is no doubt Sirince, which is probably worth a holiday in its own right! If the Izmir Agora allows you to imagine life 3,000 years ago, this village allows you to actually see it. We are talking winding, cobbled streets and architecture that is just on the right side of crumbling to be charming and attractive. Villagers go about their everyday lives, shop owners try to entice you with wonderful displays of local goods and above everything hangs the smell of freshly baking bread. For all the varied attractions of the city itself, it also boasts nearby access to some of the finest coastline anywhere in the region. The beaches are largely concentrated in three areas – Foca, Dikii and Cesme. Foca is a stretch of coastline to the north of the city, and boasts some of the best beaches in the area, with the deep Azure blue waters of the Med lapping at mile after mile of golden sand. Many beaches are private or belong to resorts but can be accessed for a small fee. Dikii has beautiful scenery but pebble beaches. Instead, this small town to the south of the city is worth visiting for it’s beautiful architecture, a relaxed vibe and some of the best seafood restaurants around. Finally, the shallow but warm waters of Cesme make it more popular with water sports enthusiasts than sun worshipers. If you like beach activities like swimming or windsurfing, this would be the beach for you. Whilst the region has been settled for a long time – the wide variety of ancient Greek and Roman ruins in and around the city is a testament to that fact that Turkey as a country is actually quite young. If you like being able to really understand the history of the countries you visit, Izmir is a great place to get to know and understand modern Turkey – because the country started right here in the city! Konak Square and its remarkable clock tower erected in 1901 is the very place where the post-WW1 fight for independence started – and where Turkey itself was born. In Turkey, coffee is not a quickly brewed beverage grabbed from a train station foyer as you rush for your train – nor is it ever, ever instant! In this country, coffee is an event as much as it is a drink and that is as true in Izmir as it is anywhere else. The city throngs with coffee houses, many of which boast quaint and historic decoration that has not changed for centuries. It is also brewed in individual pots for maximum flavor. If you think you like coffee already, you will be blown away at the heights it can reach in this city. Do expect to come back several pounds heavier from this trip – even if you do go for walking excursions in the hills. The truth is, food is very important to most Turks, and in Izmir you are going to find some of the best restaurants you will ever experience – guaranteed! The Turkish food experience is based on quality and quantity, all for relatively small amounts of money. As soon as you sit down, you will be plied with soft bread fresh from the oven, with Hummus, Cacik and mixed olives. Meals can then extend over several courses with fresh soups & stews, fresh crunchy salads – and grilled meats and fish to die for. If you think Turkish cuisine is just kebabs, you are in for a real treat! Sun, sea, beaches, history, friendly people and the out-of-this-world food – what’s not to love about Izmir, the Jewel of the Mediterranean? 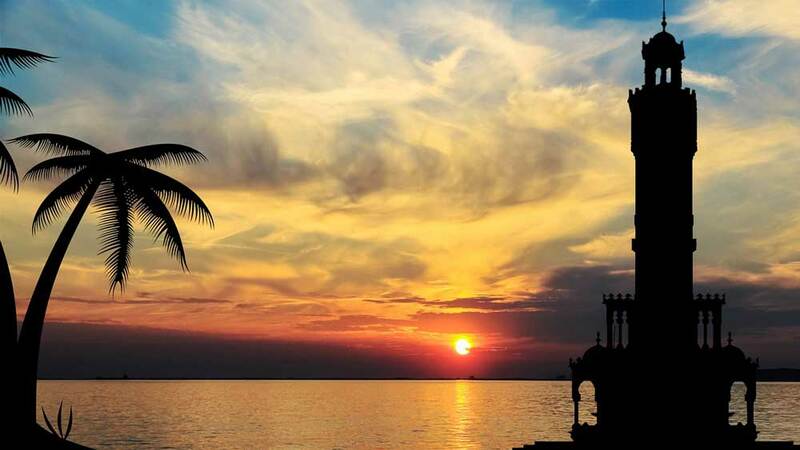 Find a flight to Izmir today, and enjoy your spring at this wondrous destination!